Grand Rapids, Mich. — Researchers investigating the whereabouts of Michigan snowshoe hares confirm what hunters have said for quite some time: The big rabbits with the white winter coats have vanished from places where they once were abundant and hunted. Their disappearance is being linked, in some cases, to a warming climate and forest habitat changes. “We looked at 134 sites statewide and found 49 percent of the historic Lower Peninsula sites, and 27 percent of the Upper Peninsula sites, do not have hares anymore,” notes Gary Roloff, assistant professor at Michigan State University’s Department of Fisheries and Wildlife. Roloff spearheaded a 21⁄2-year, Michigan DNR-funded study to assess the hare’s status and what might be done to improve conditions for the species. Biologists examining how Michigan wildlife species are adapting to climate change say numerous species may be impacted, or vulnerable, as average temperatures rise. A 2013 DNR study, “Changing Climate, Changing Wildlife: A Vulnerability Assessment of 400 Species of Greatest Conservation Need and Game Species in Michigan,” found 17 percent of Michigan’s terrestrial game species were vulnerable. Those include moose, ruffed grouse, and snowshoe hares, among others. Snowshoe hare’s winter white fur makes them more vulnerable to predators in areas with little to no snow. This radio-collared hare was studied to better understand its forest habitat preferences. Photo: Dr. Gary Roloff. Roloff said climate effects are most pronounced on the southern edge of snowshoe hare range, an east-west line across the Lower Peninsula through Bay, Midland, Isabella, and Mecosta counties. He theorizes that warmer average temperatures adversely affect reproductive success and predator avoidance. Research has shown that hare litter sizes are smaller when it is very warm. 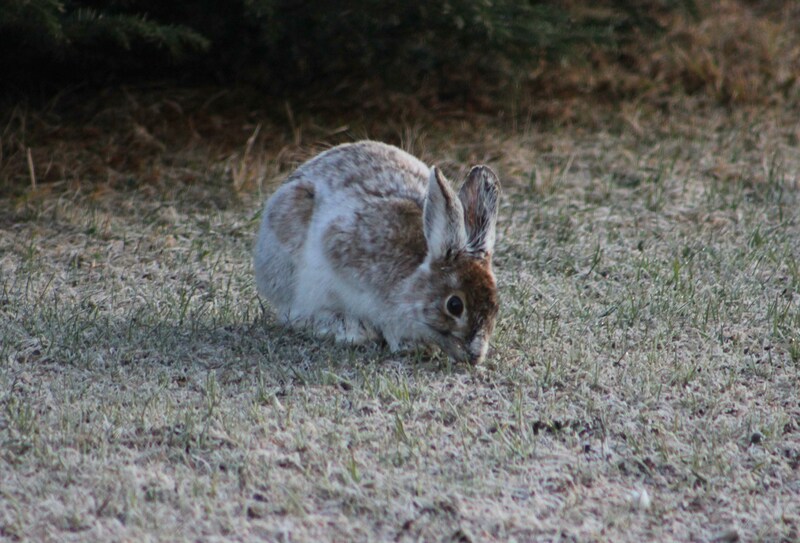 Mild winters can mean late snows and early thaws that leave the white hares exposed. 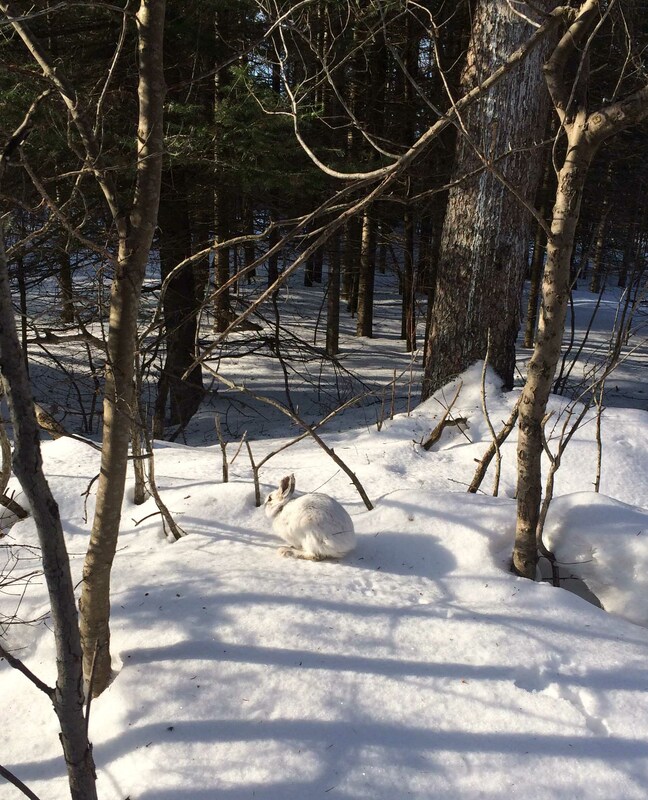 Snowshoe hares change color with the season, from reddish-brown in summer to white in winter, a natural camouflage that lets them blend in and stay concealed from raptors, coyotes, and other predators. The color shift is driven by changing sunlight patterns as days shorten and lengthen with the season, Roloff said. But the outcome, given changing climatic conditions, has been detrimental to the hare. The $118,709 study was funded with federal Pittman-Robertson revenues, funds from an 11-percent federal excise tax collected on firearms and ammunition that is returned to states annually based on the number of licensed hunters they have. It was requested by the DNR’s Wildlife Division to see if something could be done to improve habitat or reduce climate effects. Graduate students carrying out the study also found habitat changes by comparing what grows today at study sites with photographs showing what grew in the past. Snowshoe hares favor conifer stands over deciduous trees. They provide more concealment amid trunks, brush, and branches. Some of the shifting forest type may be due to the effects of climate, Roloff said. Conifers, like hemlock and cedar, both “key for hares,” are vulnerable and “will shift northward.” But state and federal forest-management practices have favored deciduous trees like aspen, resulting in the removal of conifers that are important to hares. Roloff’s study also found stem density (the number of trees in an area) and shrubs was extremely important. Vegetation thickness corresponds with concealment and cover. Those findings were the basis for recommendations that were forwarded to the DNR. They include leaving small patches of conifers standing when timber is harvested, and enhancing deciduous stands by periodically “hinge-cutting” trees, a partial cut through the trunk that results in a living thicket when the top is laid on the ground. This entry was posted in Uncategorized and tagged Climate Change, Conservation, DNR, Environment, Forests, Hunting, Michigan Department of Natural Resources, Michigan State University, Nature, Snowshoe Hares, State Forests, Wildlife. Bookmark the permalink.